Who says you have to grow up before you can drive a real racing car? The Ferrari 458 is loved by drivers of all ages for its eye-catching design and its monster power! Fascinating facts: The full size version has a powerful V8 engine that produces 475 bhp. The Ferrari is at its most impressive when you combine raw power with perfect timing and precision around the Carrera race circuit. The 1:43 scale Carrera GO!!! 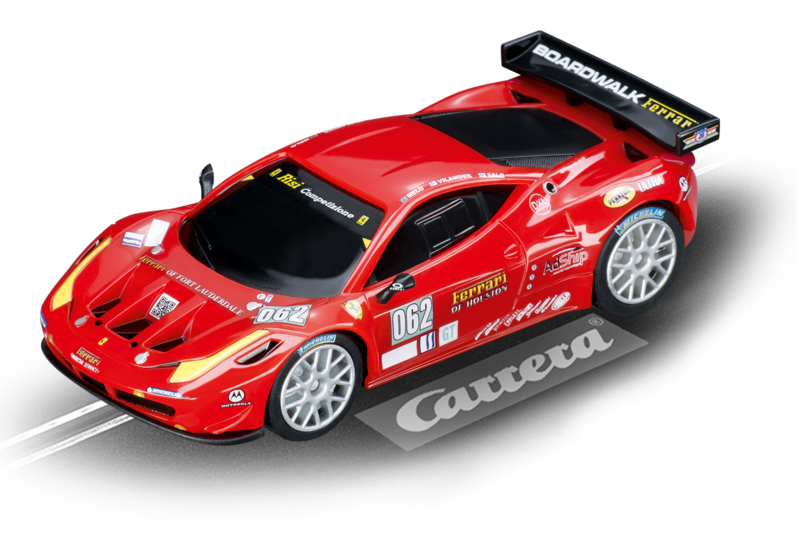 Ferrari 458 Italia GT2 Risi Competizione No.062 slotcar wins new fans everywhere with top quality authentic details. This racing car provides a perfect introduction to the Carrera racing world for children of 6 years and up.